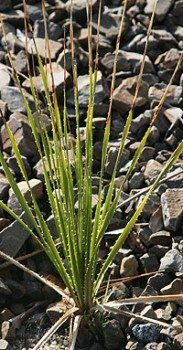 Dasylirion are a small group of plants from Mexico and the Southern USA. Related to Agave they have grass like foliage some species eventually form a trunk or stem. The Americas version of the Grass Tree. Dasylirion longifolium is actually known as the Mexican Grass Tree. Overt time some species can reach a height of 2m +, and these long lived plants make an interesting landscaping feature when mature. Dasylirion will send up a flower spike. Dasylirion longifolium is known as the Mexican Grass Tree while Dasylirion acrotrichum is known as the Green Desert Spoon. Also known as Sotol or Desert Sotol, Dasylirion wheeleri is said to be used to produce a drink similar to Tequila and Mezcal. A well drained soil and a sunny position are essential. Cold tolerant and drought resistant Dasylirions are only just becoming available on the Australian market. They are available as seed.